Today I finished the last of my broken dishes blocks, bringing my total to 20 completed blocks. 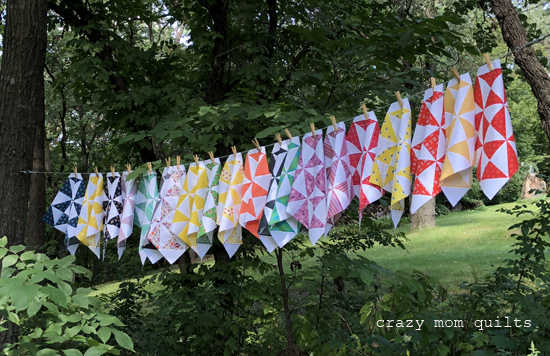 I thought it would be fun to photograph them on my clothesline for a change of pace. Aren't they soooo pretty hanging out there? I'm making another version of this quilt, except this time I'm making more blocks (20 instead of 12) and skipping the borders. I think it's going to be fabulous! 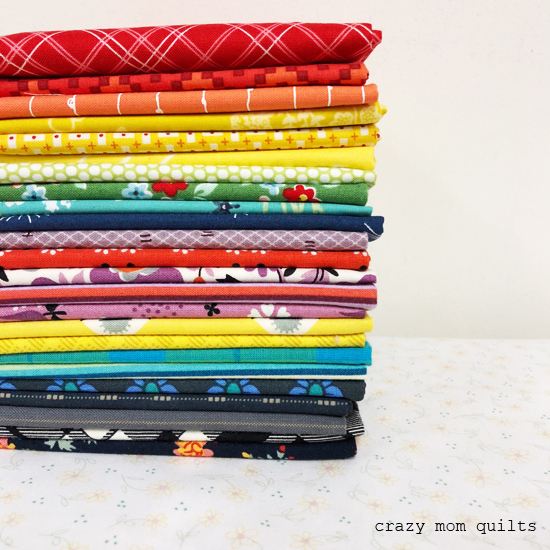 I'm using two bundles from the "I Want Her Stash" club from Westwood Acres, which were curated by Amy Smart and Denyse Schmidt. They have been curing nicely in my stash (I've had them for a few years) and I love how they play together. The background is my own fabric from my Emma and Myrtle collection for Connecting Threads. I love the vintage feel of this entire combination. It was a great exercise to use bundles picked by someone else for a change. I loved it! They look adorable hanging on your clothesline! Welcome Back! I've missed all your projects and especially Finish it Up Friday. So much fun!! The first thing I thought of was Chicklets gum. I keep scrolling back up to look at that photo! They are so happy and cheerful on your clothesline. I hope you pulled up a chair with a cup of tea or coffee and admired them for a bit, hanging there so cute! Wow, such a pretty pattern! Love the colours! This will look gorgeous, Amanda! You inspire me more than any other! Pretty blocks in a pretty setting. That is such a great photo! I think I would frame it and hang it in my sewing room. You're right. it is going to be fabulous. The colors and prints are just yummy! love the cheerful colors. It's going to be another smash! Indeed that will be a fabulous quilt! I think you should frame the picture too! (Wish I had a clothesline!) ---"Love"
Welcome back, Amanda! Hope you enjoyed the summer with your family. Oh, the colours are just fantastic, Amanda Jean! Now I'm really excited to see these two quilts come together - will be fun to see the difference in having one with borders and one without. Happy stitching and wishing you a wonderful long weekend! Great display...wonderful to have a finish.. Awesome! I have lots of fabric “curing” as well, ha! Love the Broken Dishes blocks hanging out on the line. Just gorgeous colors! Oh that will be a fun one! Love them hanging on your line!